The food safety nerd in me just had another (as my husband would say) “food safety fit”. This was the result of a post on Facebook, shared by a friend who thought it looked like a good idea: 31 slow cooker freezer meals. Actually I like the idea. The post looked promising — planning meals ahead of time (wow, that’s a concept), buying all the ingredients for 31 meals at one time, doing all the chopping and prep work at one time and then freezing what was left. This isn’t really a new theory, but what makes this specific post or collection of recipes unique is that it the food is eventually cooked in the slow cooker. What gave me the fit was the thought of the frozen food going directly into a slow cooker on low. The recipe author says that she looked up the food safety procedures and does not recommend putting frozen food directly into the slow cooker. Most of the recipes say to thaw in the refrigerator overnight before putting them in to cook. There were lots of comments from folks who were either for or against this process. 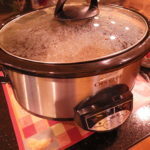 Several mentioned that the USDA does not recommend the direct-from-freezer-to-slow-cooker process. Yeah! Several others commented that they’ve been putting frozen meat in the slow cooker for years… and they’re still alive. (You know how I feel about that one). 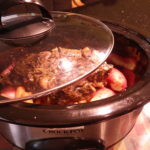 The reality is that putting frozen food in a slow cooker provides an excellent opportunity for bacteria to grow as the food and the slow cooker make their way slowly through the temperature danger zone (TDZ) to a safe minimum internal temperature. One reader commented that she took the bag of frozen food out of the freezer and threw it in the sink while getting dressed in the morning, then just put the frozen food in the slow cooker. Thawing at room temperature and then putting on low temperature to cook is just asking for trouble with bacteria growth. Other comments revealed more unique ideas on this topic. One suggested leaving the food in the zip-top freezer bag and popping it directly into the slow cooker, like a slow cooker liner. That’s another recipe for trouble. Remember: while freezer-quality bags are great for freezing, they are not designed to for long-term heating. Another person suggested freezing directly in the slow cooker liner bags. Again, these liners were not designed for this purpose and using them this way may result in loss of quality. I really do love the idea of planning ahead and doing some “mass preparation” to save time and have food ready to go when needed. So, what would make these recipes a little more appealing and safer? Check out the recipes you’d really like and start with only a few meals. Make sure your family likes the outcomes and that many slow cooked meals before you get a freezer full. This will also eliminate the possibility of overloading the freezer. Then, freeze the vegetable/seasonings and meat in separate bags. This would allow you to brown the meat before putting it in the slow cooker in the morning. Taking the time to do this can provide better color and flavor to the final product and also it helps speed the meat through the temperature danger zone. Most of the recipes say to take the bag from the freezer the night before and allow it to thaw in the refrigerator. While thawing in the refrigerator is the best method, one overnight may not be enough, so you may need to plan ahead a little more. Use the appropriate packaging materials and then use them for their intended purpose. There’s no reason that you can’t use slow cooker liners for easy clean-up, they just aren’t intended for freezer storage. As you’re getting ready in the morning, start the food off on high and then turn it to low before you leave the house. This helps jump start the temperature in the slow cooker and rushes the food through the TDZ. And above all, don’t listen to “know it alls” “old wives tales” and “we’ve always done it this way” that you’ll find in the comment sections on Facebook. Check out the evidence and researched-based references on food safety. 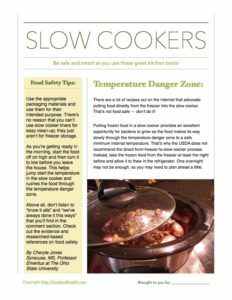 Here’s a handout with the highlights of slow cooker food safety!